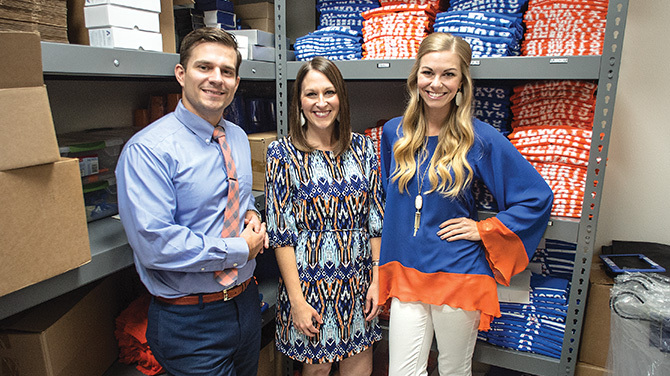 UTA is expanding the Office of Development and Alumni Relations, demonstrating its commitment to its more than 210,000 alumni, donors, and friends. Julie Barfield (center), executive director of alumni and donor relations, is working with newly appointed Associate Director of Alumni Relations Brady Minor ('16 MEd), left, and Alumni Relations Coordinator Shaunda Poster ('07 BA). Alumni and friends can look forward to a calendar full of Maverick-themed events, including a return of the popular UTA Day at the Rodeo held in conjunction with the Fort Worth Stock Show. Reconnect with fellow Mavericks through social media and check out upcoming events online at alumni.uta.edu.